Grantown on Spey's Hannah McCook beat England's Curtis Cup player Sophie Lamb (Clitheroe) at the first hole of a sudden-death play-off to win the Welsh women's open amateur stroke-play championship at Aberdovey Golf Club. 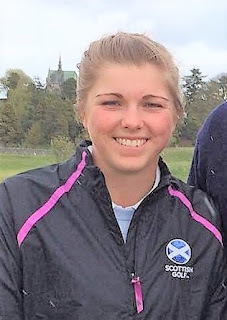 Both players had 54-hole totals of seven-under 212, finishing six strokes ahead of the three players who shared third place on 218, Scot Chloe Goadby, another English Curtis Cup selection Lily May Humphreys and Thalia Kirby (Harleyford). McCook, pictured, overnight leader by two shots, was pegged back by Lamb over the outward half of the final round, Hannah taking 34 shots to Sophie's 32. McCook then birdied the 10th, 12th and 13th to regain the lead but opened the door again for her rival by taking a double bogey 6 at the 14th and bogeying the 18th, coming home in 37 for a 71. Lamb birdieing the 10th and 14th. Her only bogey of the round came at the 11th in halves of 32 and 37 for a 69. But McCook prevailed in a sudden death play-off for one of the best wins of her amateur career. Scotland 1 (Hannah McCook, Shannon McWilliam, and Chloe Goadby) tied with England 1 (Georgia Price, Lily May Humphreys and Sophie Lamb) for the team championship. Both teams totalled 430. 430 Scotland 1, England 1. 212 H McCook (Grantown on Spey) 71 70 71, S Lamb (Clitheroe) 69 74 69 (McCook won sudden death play-off at first extra hole). 218 C Goadby (St Regulus) 73 74 73, L M Humphreys (Stoke by Nayland) 74 74 70, T Kirby (Harleyford) 76 71 71. 221 B-J Smith (Woodhall Spa) 74 75 72, P Grant (Lisburn) 73 75 73.